Our music, Scripture and Pastor Dave's messages are centered around Angel messangers: Old Testament Angel Characteristics, and New Testament Angel witness: Zechariah, Mary, Joseph and the Sheperds. 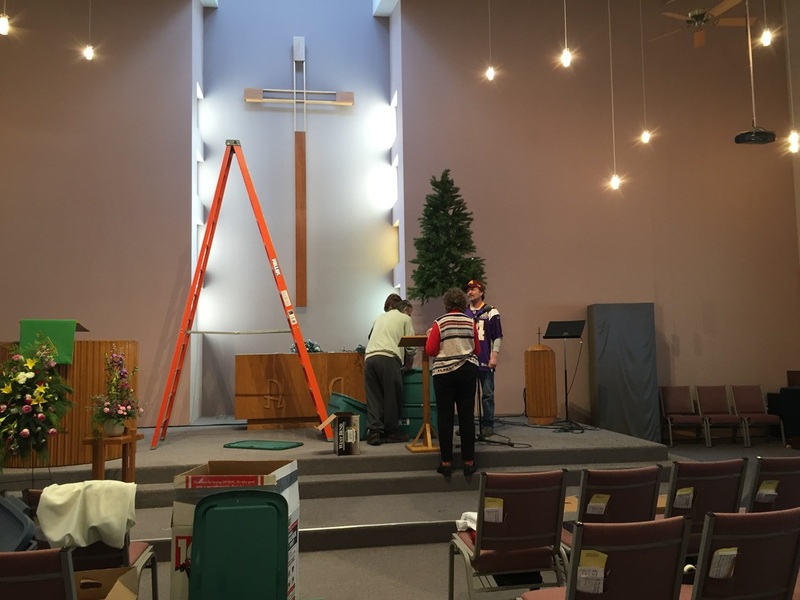 Members and friends of Mt Bethel gathered their angels together to create a heavenly host of angels decorating the sanctuary for Advent-Christmas time. Christmas Eve at 5pm and Day at 10am we gathered to share in the Christmas story through song and Word. Our prayer is that all people in the world would experience the grace and peace of God thorugh the Holy Spirit. Click here for photos of 2016 Christmas at Mt Bethel Church. 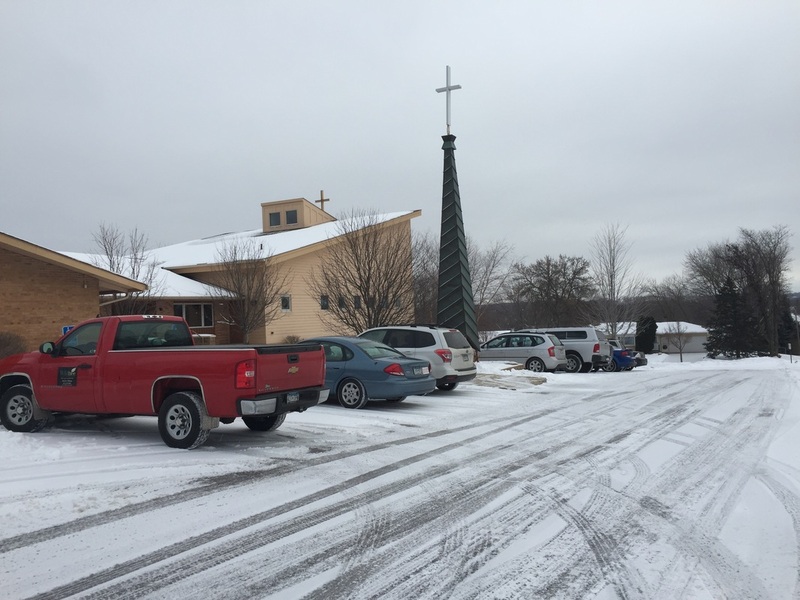 Christmas Offering: Our Christmas offerings are to Minnesota’s United Methodist Annual Conference to help us, Mt Bethel Church and more, across the State of Minnesota plant new congregations. The goal of the United Methodist Churches in Minnesota is one new congregation a year for 10 years AND assisting in the revitalizing of 20 congregations each year. Thank you for the generous giving in Jesus Name to transform lives. Giving on line by clicking here is one option for giving. Mt Bethel's Deloris H has knitted scarfs for every kid in her neighborhood. Who is next? She has now enough scarfs for a classroom at Hilltop Elm. Deloris is pictured with the school nurse and social worker when she and Pastor Dave dropped off the scarfs. Word is the Early Childhood-Pre-school Program at Hilltop Elm needs scarfs. Deloris has begun knitting for them. ​ If you have extra yarn and would like to pass it along to Deloris H, she is accepting donations for her knitting ministry for our Mt Bethel Church's neighborhood kids at Hilltop Elementary. Your yarn donations can be dropped off at church. Deloris' yarn preference is Red Heart Super Saver. Want to join Deloris in this project of warming the necks of neighborhood kids, she'd love to tell you about this ministry on Sunday mornings. ​ December 2016 Grateful hands, loving hands, friendly hands, willing hands, giving hands, strong, kind caring hands- Our Mission Outreach Evangelism Team facilitated a gift of encouragement for Hilltop Elementary facility and staff. Attendees to worship on Dec 11th helped write 120 hand notes which were attached to lotion. Pastor Dave delivered the notes and hand lotion gift the following week to Hilltop Elementary facility and staff. Teachers take a hand, open the mind and touch the heart. We are grateful. "Jesus still calls us to God’s perfection — to grow in our awareness of God’s grace and in our understanding of his call on our lives. Jesus calls us to do one more thing." Feed My Starving Children November 30, 2016 Lots of meals were packed with the helping hands and feet from Mt Bethel Church- Linda, Joe, Sherry, Ellen, Ben, Polly and from New Heights Church - Marsha, Nathan & Pastor Dan ... along with us a bus full of confirmation kids and their leaders from Hastings. Yes, 108 boxes, 23,328 meals packed in one hour and half, averaging 259 meals packed each minute. We were so busy packing, we didn't pause to get photos except for the summary of our evening. Our meals will go to Haiti supporting recovery from Hurricane Matthew. Mt Bethel Church made a $200 offering which will feed four children for a year. Thank you for generous serving and generous financial support in Jesus name. Walk to End Hunger a family-friendly 5K fun walk held on Thanksgiving morning 7:00am-10:00am, in the Mall of America, was a great way to start the Thanksgiving holiday off right- giving back before you give thanks! Since its inception in 2008, the Walk to End Hunger has raised over $1.2 million to help support hunger relief organizations working to eliminate hunger in the Twin Cities metro area. 100% of our $1,760 Team: MOUNT BETHEL UMC donated dollars will go to support Neighbors Inc Food Shelf. Led by Team Captain Tim Bomstad, persons clicked and joined Team MOUNT BETHEL UMC by walk &/or a donation. Some made their donation through Sunday morn offering and other donated needed items. According to Neighbors Inc, $1760 will feed a family ($25/week) for 60 weeks or two families for 30 weeks. Click here for pictures. Our walkers: Terry Akemann, Al & Darlene Ashley, Dave & Lisa Brown, Alan Oferosky, Deb & Lyssa Schneider and Tim & Ellen Bomstad. Additionally over 60 pounds of food and hygine product was delivered to Neighbors Food Shel in November. Thanks gathering: Giving thanks for the many blessings of the past year… Mt Bethel Church was invited to join New Heights Community Church for Thanksgiving dinner (turkey and all the fixings) on Sunday, Nov. 20th following worship (11:30a) in the Fellowship hall. Dinner was coordinated by New Heights Church with members of both churches contributing to the buffet meal. Click here for photos of giving thanks together. Thanksgiving Eve (Nov 23rd, 6:30pm) Mount Bethel Church and New Heights Community Church hosted an ecumenical worship service for our community; songs of gratitude, testimonies of thankfulness, scripture, a message from Pastor Dan Schauer. Following the benediction we gathered in the fellowship hall for pie. Thirty plus community members participated in worship of giving thanks and relationship building in Jesus name. Veterans Day 2016 Thank you to all our Veterans & military personnel and their family for the sacrifices you have made for our freedom. Veterans and their family and friends were invited to attend two area celebrations remembering and honoring Vereran's and their service to our freedom. 1) The students, faculty and staff of Eagan High School invited veterans and their families to the 10th Annual Veterans Day Recognition Assembly Wednesday, Nov. 9, 2016 at 9am in the main gymnasium of Eagan High. (Due to a scheduling conflict the assembly was held on Wed. Nov 9. not the 11th of November) 8:15am, Social hour with coffee and donut/bagel breakfast in the Student Commons for Veterans and their families. 9am, 50-minute assembly will be held with Military Personal from the United States Armed Services as well as the Eagan High School student body. Click here for more information. 2) Also communicated was an invite to the Official State of Minnesota Official Veterans Day Event,November 11, 2016 at Veterans Memorial Community Center, here in Inver Grove Heights. There was a free breakfast from 8:30 to 9:30am followed by a program at 10am Click here for more information. All Saints Sunday Worship we remember the glory of God in the saints who have gone before us. We use the New Testament definition of saints meaning of "all Christian people of every time and place." The Saints, text focus: Luke 20: 27-38 "...He is not the God of the dead, but of the living, for to him all are alive.” Reading of the Names- Sue Lehman, Bob Landru, Jerry Rysavy, Ken Sickinger, Bob Borst, Garrison Tienter, Annie Pfeiffer, Marlys Erickson, Don Lawrence, Charles Wetheral, Margaret Silvi, Gordon Emerson, Ginny O'Hair, Joyce Lauer, Bruce Polkinghorne, MaryLou Wood Lamain, Conrad Villella, Vernita Borkenhagen, Bishop Emerson Calaw, and Roselyn Rysavy. Our offerings at work to transform the world in Jesus Name. 2016 Missionary Support summary. Two very different opportunities lay before the newly-ordained pastor, John Wesley, (founder of the United Methodist Church). One was a stable position with the church in which he had been raised. The other was a missionary opportunity in a land far from home - America. 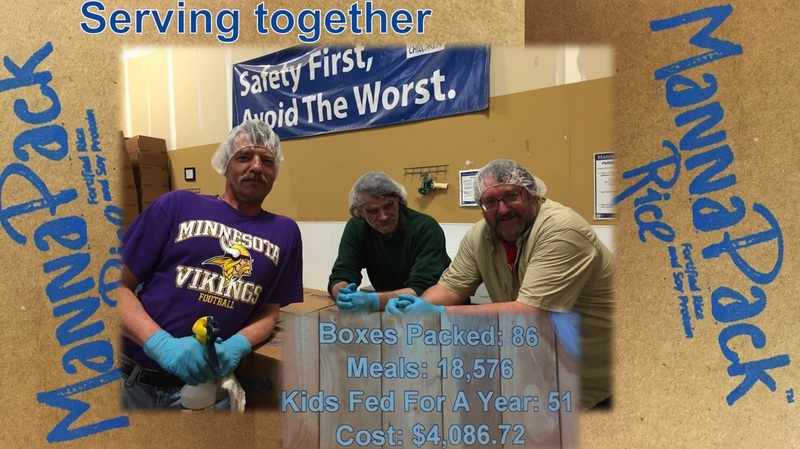 Feed My Starving Children $200 quarterly - $800 annually in addition to a quarterly packing team at the Eagan, MN facility. Click images for pics from worship. October 30, 2016 Celebrating the Good News of great Joy with "Christmas in October". Oh my Goodness! What fun it was in worship as we were reminded of the 'Good News' of great JOY for ALL people. A Savior born & alive Today. Christmas is a REAL, feel good story about Joy. Choose JOY as a Jesus follower and in the coming weeks- Bring Joy to others. Be an Angel of Good News. Luke 2 1-10. Some of us chose to come to worship dressed as nativity characters and as Luke 2 was read we were able to bring the Good News to life. Oh yes, prior to the scripture and Pastor Dave's message, we played Christmas Wheel of Fortune. The winners, Ardie and Lora. Oct 29th, We got to meet many from our community at our 2016 Craft Boutique - Craft Sale. Vendors and crafters got to market the outcomes of their talents along with visiting and a delicious Chicken noodle or Chili soup lunch. Again, a tremendous amount of appreciation to members and friends of the church for your faithfulness of communicating, attending, bring friends and active participation in our event. $1000 was raised for ministry to our community. click the image or here to see pictures. II Cor 9:15 Thanks be to God for his indescribable gift! Sunday, October 23rd, we actively participated in Be Blessed “Consecration Sunday” where we dedicate to God our financial giving intentions for the 2017 ministry year. We held a “mini brunch” beginning at 9.30a in the narthex. In worship we gathered our jingling piggy banks of dimes and quarters that totaled over $170 to bless the mission field of planting new churches in Minnesota; Reach Renew Rejoice. HOPE! – July/August time catastrophic flooding in the Gulf states, (especially hard hit Louisiana), wildfires roared thru communities of parched Western States and September hurricane Matthew barreled through the Caribbean and Eastern costal United States. The United Methodist Committee on Relief (UMCOR) was in contact with its partners in each region with immediate Relief, Help, and Hope. Our donations make a difference, in August and September members and friends of Mt Bethel Church sent $794 to support UMCOR for disaster relief. Thank you for generous giving! Relief donations are accepted on line click here or place your donation in Sunday worship's offering basket, designated UMCOR and Mt Bethel United Methodist Church will get your donation to UMCOR to make a difference and bring HOPE in recovery. We lift prayers too for hope filled attitudes, strength, perseverance, patience, safety of residents and relief workers. ​Click here to read more about what to donate in time of disaster. The week of October 10th, 2016 on behalf of Mt Bethel Church, Pastor Dave delivered over 110 bags of impromptu encouragement of M & M's: Much & Many and Marvelous & Magnificent treats to the faculty and staff of Hilltop Elementary. ​ Much & Many thanks for ALL you do. We really appreciate it! 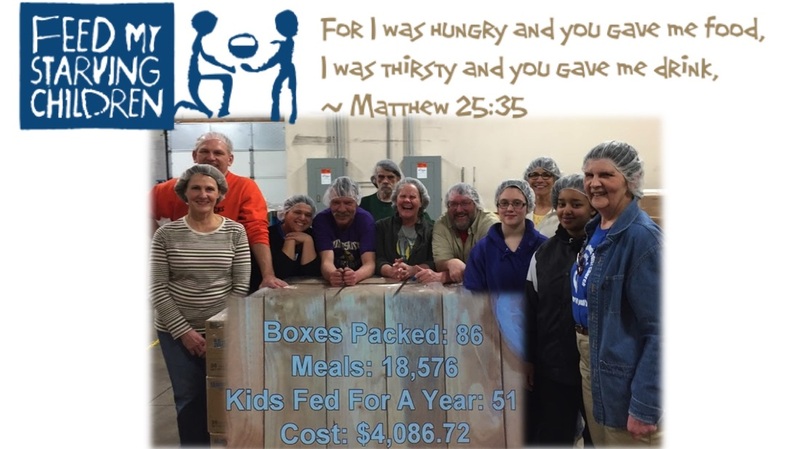 Gratitude to our garden caretakers: Joe B., Barb M., Deb S., Al O., Kathy B.
September 21, 2016 we served together at Feed My Starving Children; boxed 62 meals, which converts to 3,392 meals which feeds 37 kids for a year at a cost of $2,946.24 Click here and view pics of us serving together. Hello Fall! Our October time past practice is to head to Nelson's Apple Farm in Webster, MN and pick, glean the trees for Neighbors Food Shelf. This year Nelson's apple gleaning will not be happening. Unfortunately Nelson's Apple Farm lost 80-85% of their apple crop due to a freeze on May 14, when the apples were about dime size. The quality of the fruit Nelson's trees do have is very poor. They are grateful to other local orchards who are supplying them with apples for sale. Ross and Karen hope next year will be back to "normal" and have tree gleaning for the food shelves. "We really look forward to the church groups coming out to our orchard, but we will not have this opportunity this year for field gleaning. We hope some of the persons will come and visit our orchard anyway and buy some apples from us as we need the business. We are buying apples from other orchards in none freeze areas of the state. Visit us!" Ross & Karen Nelson click here for a map. Mon-Fri 3-6pm, Sat-Sun 10a-6p. September 17, 2016- Phase I, Done! Bring on 1.5 & 2. In March, our Ad board recommended an investigation into a Sanctuary upgrade to address improving acoustics, hearing/articulation clarity. Working with AVE/ Audio Video Electronics rep Kerry, a three Phase upgrade was established. At our July Ad Board meeting, approval was given that launched Phase 1: application of wedged acoustical panels to the side walls of the sanctuary and two multi-directional microphones. A cost of $7000 in memorial dollars. Phase I.5 identified as acoustical panels applied to the back walls of sanctuary approx. $3000 cost and Phase II is a video projector, mount and equipment to implement wireless technology usage cost of $10,000. Heart warmed gratitude for the memorial dollars used to purchase Phase I. Thank you to the muscle (Pastor Dave, Vern and Linda Emerson and an anonymous helper) that unloaded the FedEx truck receiving over 850 pounds of acoustical panels and got them moved to the sanctuary. Thank you to the Thursday Clean Team who moved lots of chairs out of the way for a scaffolding pathway and to Steve Watrud for the use of scaffolding for the project. A drilling thank you to our installers; Daniel Tabbert, Jake Tabbert, and the ground crew of Vern and Linda Emerson. Have got to give the stud finder a thank you! shout out too. Lastly thank you for the Prayers who prayed blessings over this project. 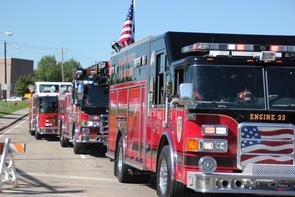 I am humbly grateful for faith and hard work perseverance, project manager- Polly T.
click image of pictures of our First Responders at the 2016 IGH Day's parade. Photos conclude with worship prayer. Replace frustration with patience and perseverance. *Overcoming adversity means getting back up after getting knocked down. * It means pushing through a difficult and trying circumstance and not giving up. *It means we learn from the bad things that happen as well as the good. "Not only so, but we also rejoice in our sufferings, because we know that suffering produces perseverance; perseverance, character; and character, hope. And hope does not disappoint us, because God has poured out his love into our hearts by the Holy Spirit, whom he has given us." Romans 5:3-5. Pray for the Lord's will to be done. We come from many and varied backgrounds, yet we work side-by-side to serve our country, communities and fellow citizens. Our family life is interrupted by emergency calls and inevitable dangers. We face new challenges daily. Challenges to our bodies, challenges to our minds and challenges to our spirit. We love our vocation and considerate it our calling. ​Truck enthusiast unite! We helped advertise the opportunity to support a generous Christmas-time toy supporter of Neighbors Inc. This opportunity to serve event is just right for those with an interest in Big Rigs, the likes of: Kenworth, Volvo, Freightliner, Peterbilt, Western Star, Mack and more… Big Iron Classic, the largest truck show and charity drive in the Midwest, needed volunteers for security the evenings of September 9 & 10. The Big Iron Classic gave to Neighbors Inc, 24, huge (3feet x3feet) boxes of toys to be distributed to Northern Dakota County families. Wednesday, August 31, 2016 Mt Bethel Church provided our neighbors down the street, 70 some, faculty & staff at Hilltop Elementary lunch during their pre-school workshop week. A lunch of; ham, turkey & cheese sandwiches, chips, potato salad, yogurt, beverage and mini candy bar takeaways. Our Mt. Bethel luncheon hosts, power prayers & more... Judy & Preau Alich, Mary & Riley Anich & Kathy Behrendt. Posted the thank you's we received.... and Thank you too. 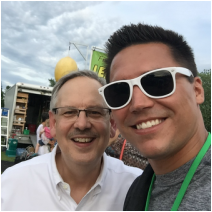 Click image to view pictures from our 2016 picnic at Pastor Dave & Lisa's. Thank you Pastor Dave and Lisa for a delightful picnic at your home and warm hospitality. Beautiful weather (sunny & 78 degrees), delicious food and grand fellowship. Click here for pictures. Occasionally in our weekly e-newsletter it is asked ... How have you experienced God recently? Then encouraged, challenged to tell another. 2 Kings 4: 1-4 and Luke 6: 37-38. For our 2016 stewardship campaign Pastor Dave challenged us to do the “big ask” of ourselves, of God and of each other as we chart a course for the future and consider actions we need to take to make 2016 a great year for Mount Bethel Church and the Kingdom of God. Let us consider 2016 in just the past few weeks as a Body of Christ.... A blessed summertime… “good measure, pressed down, shaken together and running over” Luke 6:38 … we are witnessing. A big ask, prayer and generous giving for the reduction to elimination of the mortgage debt is resulting in an additional $2000 payment to the loan’s principal. A big ask with Amazing Beginning’s and New Height’s Church partnering with us in hosting IGH’s Night to Unite for the neighborhood. Attendance nearly doubled in opportunity for us to build connection with our neighbors. A big ask to begin now gathering collectively items for Samaritan Purse Operation Christmas Child shoebox ministry. Two large tubs of items collected so far. A big ask for the IGH ecumenical ministry Back to School Bash. Rejoicing that members and friends of Mt Bethel filled the grocery cart 4 times with new school supplies and gently worn clothing for the Back to School Bash. Additionally we supported the purchase of 1000 backpacks with a $500 donation. A number of us will also give of our time helping to host or attending the event. What Big Ask, good measure, pressed down, shaken together and running over blessings do you add? click here and submit - Add to our list. Collectively, much generous living in Jesus Name! 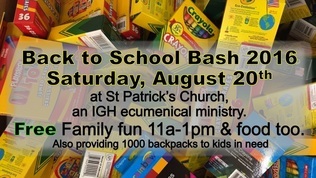 Inver Grove Heights Ministerial Association is partnering to host the 10th annual “Back to School Bash”. Music: The Minnesota Teen Challenge Choir. FREE event for the entire community. Thank you for attending the 10th Annual Back to School Bash, A local IGH ecumenical ministry event celebrating the joy of learning with FREE food, games, bouncy(s) and music. Also providing 1000 backpacks with school supplies to IGH elementary, middle school and high school kids in need. The rain did not stop the celebrating. Activities were moved indoors to St.Pat's Shamrock Hall. Attendee or volunteer thank you for coming together. As a church body we delivered 4 grocery cart loads of school supplies and clothing to support his event. Saturday, August 20, 11a-1p at St. Patrick's Church. Why: To get to know our neighbors, have fun and promote community. Meal: Hot dogs, chips & root beer floats provided by hosts. Event Hosts: Amazing Beginnings Montessori & Childcare Center, New Heights Community Church, and us, Mt Bethel United Methodist Church. 7:45p United in prayer for attendees and our neighborhood. Attendees were extended an invite if they chose to bring food items for Neighbors Food Shelf or new school supplies that will go into the 1000 backpacks for the Back to School Bash. Most importantly they came. Click here to view invite. Review of hosting the second Night to Unite! in neighborhood on church grounds 70th Street & Carmen: 300, 2sided brightly colored flyers distributed 2 weeks prior from Cahill to Colman Avenues West to East and South to North 70th street to 68th street. Weekend prior 10 yard signs placed at corners of streets in/out of the neighborhood. 4 bags of groceries and 2 stuffed bags of paper bags gathered for Neighbor's food shelf. Guesstimate 100plus attendees to the event making connections with oner another. Click here for photos. ​August 1, 2016 Update & good news--- Mt Bethel Church has a mortgage (Sanctuary and lower level addition) balloon due soon. Pastor Dave put forth in mid-July an $80 per giving unit challenge to offset the estimated closing costs of $3400 expected to incur. The Trustees and Finance Chairs have been able to work with Bremer Bank and negotiate a Mortgage Loan Modification instead of a refinance. This negotiation has reduced closing costs by half. Due to negotiation and overwhelming giving generosity by our congregation, we, Mt Bethel Church will make an additional $2000 principal payment in debt reduction. THANK YOU every one for your generosity in offerings and prayer for reduction – elimination of debt. Don Lawrence is in God's Glory! Don's Celebration of Life service; Monday, Aug 1st, at Mt Bethel Church. Visitation 10am, Service, 11am with lunch following. Prayers for his beloved Margaret and family be comforted by the many thoughts and prayers of love sent their way. 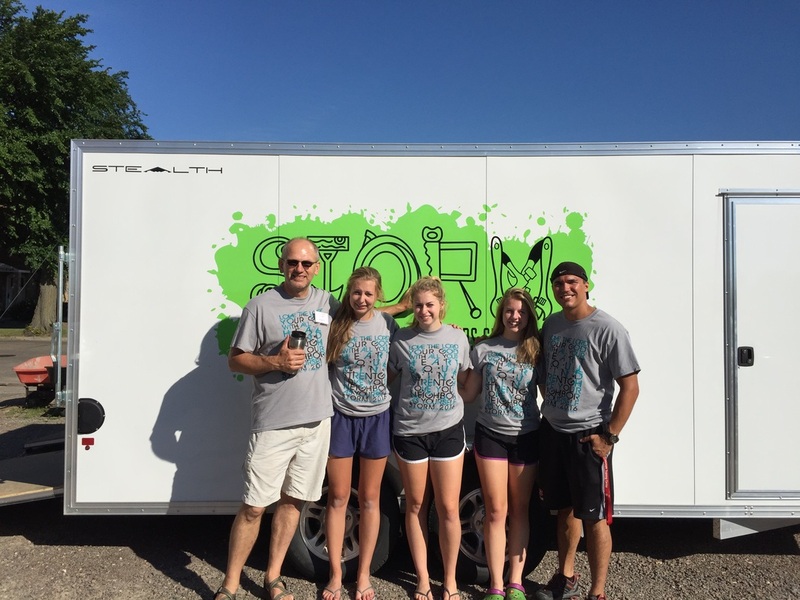 Praying a blessing over our STORM Campers: Jake, Shelby, Reegan, Emma & Pastor Dave. Click on image and be connected to a YouTube channel of daily video reflections from STORM 2016 in Marshall, MN. STORM - Service To Other in Relational Ministry. Click on image and go to photo album from camp. ,June 2016, Due to the generosity of Mount Bethel Church in the month of June, 68 pounds of food has been delivered to Neighbors Food Shelf. June 22, from 6-7:30 pm, 22 participants from both New Heights and Mount Bethel Churches were the hands and feet of Jesus serving with 120 others from the metro area. 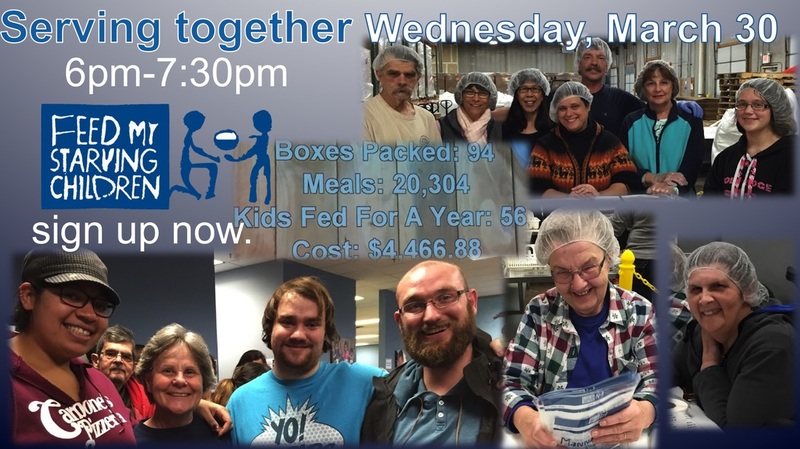 In one hour packed 116 boxes of food; (3712 bags of vitamins, dry veggies, soy protein & rice) resulting in 25,056 meals which will feed 69 kids for a year at a cost of $5,12.32. Pastor Dan facilitated the blessing of food at the conclusion of our serving. Click image and be directed to the Annual Conference Home Page. A Love Offering for Missions was collected within Minnesota’s United Methodist Churches and delivered to the Annual Conference session, collectively totaled over $90K. Member and friends of Mt Bethel Church extended $275 in love. Joy of generous discipleship – giving till it feels good. The Love Offering benefits international, national, and Minnesota missions. The conference Missions Promotion Team determines the annual recipients. The 2016 Annual Conference theme is "Living Generously: Unleashing God's Gifts" and funds from this year's Love Offering is designated to these projects: Click on image for more information. Offerings are designated to: Minnesota Council of Churches Refugee Services: 40%. United Methodist Committee on Relief (for health kits): 10%. International Child Care, Dominican Republic: 40%. Volunteers in Mission Scholarships: 10%. Pastor’s Report - David E. Brown Grace and peace to members and friends of Mt Bethel UMC! As I finish my third year of serving as your pastor, my heart is filled with gratitude for your faithfulness to Jesus, first of all, and for the way in which you live out that faith through Mt Bethel Church. 1. We experienced what it would be like to have another staff person as David Hodd served as an Eli project intern. We were all grateful for his ministry among us. 2. We held our first Neighbors Night Out in quite some time. About 25 neighbors joined us for refreshments and fun. 3. We held a Thanksgiving Eve service that was a general invite for the community. 4. We invited New Heights Community Church to share our building for worship and office. 5. 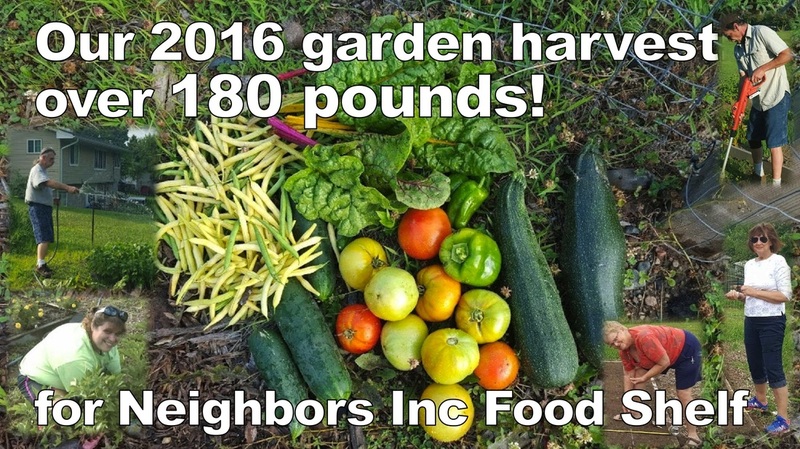 We harvested 200 pounds from our garden for the food shelf. We have also continued some effective ministries. 1. Ongoing care and appreciation for Hilltop Elementary teachers and staff. 2. Church 2 groups growing our discipleship and building relationships. 3. Worship themes for the big seasons of the church year, Advent and Lent. 4. Engagement in a variety of service projects resulting in mission. 5. Ongoing financial health due to generous giving. Numbers don’t always tell the whole story, but I would say that our worship attendance, after improving last year, is holding steady at about a 58 person/Sunday average. Individuals participating in the various ministries and teams of our church is probably around 70% of that worship attendance. As I understand our current finances we are holding our own and continue in a good position to meet our obligations as well as fund ministry. As we look to the new year, I believe there are three areas that we need to focus on. 1. Inviting new people to participate in our life of following Jesus. We are a great congregation and have a blessed life to share with our neighbors. We are all responsible for inviting others and we need to have a team of people focused on thinking of new ways to reach our neighbors. 2. Caring for one another. We already do this, but some of us think it can be done better. Joann Larson has agreed to lead a team of people in making this happen. 3. Continued generosity. We still have a large debt for our size congregation. Some fear what would happen if we “lost” the preschool income. We are sometimes hampered in making any improvement because of funding. It would be great to get past that! 4. (I always have an extra point or two!) Greater participation by all our members and friends in carrying on the ministry of our church. Remember the church is not a building, the church is not a steeple…the church of Jesus Christ is a people…a people called by God to serve one another and to serve the neighborhood and world that we live in. It is how we follow Jesus. I am glad to be your pastor and look forward to what the new year will bring. Your input is valued. Help our leadership team cast vision for Mount Bethel Church. “Being a good neighbor is being in relationship…not only to Christians, but also to people of other faiths or no faith.” Click image to read more. United Methodists across the world are horrified by the despicable act of terrorism in Orlando, Florida, that took the lives of 49 individuals and wounded 53 others. We are in shock. We join those who grieve. We pray for the victims, their families, and the LGBTQ community targeted by this hateful attack. We stand against all forms of violence, committed anywhere in the world by anyone. ​Old Salem Shrine hosted the annual Founders’ Day Service on Sunday, June 5th at 3:00 P.M. Prior to the service an Open House from 1:00 – 3:00p. With the beautiful weather of gentle breeze and temps in the 70’s there was a great turnout of persons and families experiencing times gone by and see how our ancestors worshipped in 1860’s. The service was led by Rev. Gail and Rev. Dennis Alexander from Faith United Methodist Church and Mounds Park United Methodist Church. Message “What Happened Here” Ephesians 2:19-22. Our Deepest Sympathy is expressed to the Annie Pheiffer family. Celebration of life; Monday, June 6, 2016 at 11 am. Pentecost Sunday, we came to worship wearing red and on Pentecost, the Birthday of the Church, Mt Bethel began sharing our church facility with New Heights Community Church. NHCC worshiping in the fellowship hall at 10am & Mt Bethel in the sanctuary at 10am. Early May, three leaders of NHCC met with MB leaders (J Gregg, B Mahovlich, L Emerson, J Lewis, V Emerson Pastor Dave & P Tabbert) for conversation of understandings and expectations as both churches move forward in distinguishing ourselves in the community for Jesus. Growth and change go together. Churches that grow have to change. Thriving congregations are ten times more likely to have changed themselves than struggling congregations. Change and conflict go together. There is a subtle interplay between change and conflict that cannot be avoided but must be understood and engaged. Growth and spiritual vitality go together. A growing church is more likely to be spiritually vital and a declining church is more likely to be less so. Worship changes often lead to growth. Changing worship often leads to both growth and spiritual vitality. Young adults are increasingly scarce in churches. 20% of US population is 18-34 but only 10 percent of congregations reach that level of participation by young adults. Only one in ten congregations make reaching young adults a priority. Laity reach other laity. The more lay people are involved in inviting others to church, the more likely that church is growing. Distinguish yourself in the community. Congregations that are seen as different in some way from other churches are more likely to grow. Sunday, April 10, following worship, members of Mt Bethel Church took a consensus vote in regard to sharing space with New Heights Community Church on Sunday mornings. Results: 1 abstention, 5 no and 44 yes. Consensus is to move forward to sharing Sunday morning facility space with New Heights Community Church. -New Heights will share expenses at $400/month. Town Hall meeting following worship, Sundays March 6, 13 and April 3rd. Time-line of building a relationship with New Heights Community Church is highlighted in our Ad Board meeting minutes titled: click here to read 2016_2_mt b min and 2016_3_4 mt b min Administrative Council meeting minutes. The Minneapolis/St. Paul community is deeply wounded. The shooting of Jamar Clark, the subsequent protests, the pleas that Black Lives Matter, and now the announcement that the two police officers involved in the incident will not be prosecuted has the community crying out for justice. And, of course, there are different perspectives on what constitutes justice. For the legal system, justice is defined by the evidence (some of which remains disputed). For the families, Northside neighborhoods, and many concerned citizens, justice is defined by fairness and restitution. Tragically, Jamar’s death cannot be reversed and the grief and anger experienced by so many cannot be assuaged. Both viewpoints have merit and standing in the law. But neither goes far enough to create justice. Justice is about restoration. It is about putting things back the way God intended. It is about restoring the Beloved Community. Read more, click here. Good news of generous sharing, March was the Statewide Food Share campaign, here at Mt. Bethel Church too. Thank you for your generous donations of food and money. $135 and 299 pounds of food was delivered to Neighbors Inc to meet the needs of Inver Grove Heights and South St. Paul families. Mt Bethel Church is a founding partner of Neighbors Inc. Neighbors Inc.
March 2016 collective results: Neighbors Inc collected a combined total of 347,639 pounds of food and dollars during the Minnesota FoodShare month, finishing third among the 300 Minnesota food shelves participating in the March campaign. Thank you for helping stock the shelves for the months ahead! The Gertens Spring Fundraiser was launched the month of March. Click here to see the 2016 Gertens order form! We also had a beautiful color brochure to help members & friends of Mt Bethel Church decide. The orders and payment were due Easter Sunday, March 27. Delivery - pick-up date is Friday, May 13. Proceeds from our Spring Gertens' fundraiser are used to beautify the church grounds. Our Lenten and Easter offerings received this year will be given to the Minnesota Annual Conference Reach Renew Rejoice project. RRR is a Statewide mission strategy for starting new churches and growing existing churches by equipping them to increase spiritual vitality. Thank you, thank you, for generous Lent and Easter offerings in Jesus' name to reach new people and renew the Church in Minnesota. I greet you in the name and spirit of our Lord Jesus Christ who prevailed over the dominion of death. During the past 40 days, we have been on a journey of self-denial, sacrifice, and changing our hearts. We have engaged the ancient spiritual discipline of laying aside those things that limit our lives and destroy our relationships with God, others, and ourselves. The ashes of repentance are washed away as we prepare to exclaim with joy: Christ is risen! Christ is risen, indeed! Alleluia! As you know, I am a native of North Dakota. Click here to read more. Minnesotans' Praying for General Conference 2016 on Wednesday, March 23rd. In your time of prayer, be sure to allow for some silence so that you might be open to hearing and receiving what God speaks to your heart and mind. Lent 2016 Wednesdays we gathered in Mt Bethel's fellowship hall for mid-week worship averaging 40 to 60 attendees. Members from Hew Heights Community Church also participated with us. Beginning with a soup supper at 6p, and from 6:30-7p We heard stories of faith, God at work in the lives of community members; Lisa Brown, Rob Scofield, MaryAnn Curro, teacher from Hilltop Elementary, Luke & Amanda Stombaugh and John Parkes’ story of sobriety. Each- "This is my story, this is my song, praising my Savior all the day long." Our ministry work areas served the weekly soup suppers; MOE Mission/Outreach/Evangelism, Worship, Trustees, Finance and SPPR Staff Pastor Parish Relations. To cover supper cost a free will offering was received with overflow offerings extended to MN United Methodist Church Conference for Reach Renew Rejoice mission field in Minnesota; making disciples for Jesus Christ for the transformation of the world. Click on image for more information about UNCOR. For more than 50 years, United Methodist congregations have been taking part in a special One Great Hour of Sharing offering, laying the foundation for UMCOR’s (United Methodist Committee on Relief) ministry of relief and hope. Our Mt Bethel Church, One Great Hour of Sharing offerings totaled $300 for UMCOR. Thank you for generous sharing! Click on Image for our order of worship. 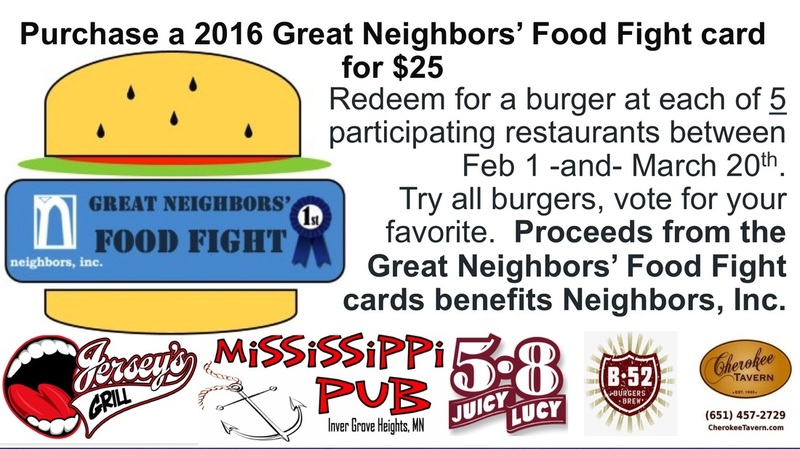 15 of us purchased Food Fight card 5 burgers/$25. Proceeds of $375 benefit Neighbors, Inc. mission field. Click on image - Chuck knows small groups and his knowing helps us know too. Church2 September 2015 thru January 2016 Mt Bethel/MB Church offered 5 monthly options for growing in relationship with Christ and each other by gathering together in a small group setting... Church 2... in homes. A meal was shared along with highs and lows of daily life. Prayer happened and read scripture which engaged spiritual conversation. When Pastor Dave is present groups shared in communion. Over 35 members & friends of MB participated. Thank you to the gracious hosts; J,B,L Brausen, J & L Gregg, J Lewis, S Draine, and P Tabbert/A Wentkiewicz. Potluck meal sign-up sheet for feeding the choir and worship attenders. Thank you for signing up. January 10, 2016 we hosted a worship service with Minnesota Teen & Adult Challenge Choir. Following grace filled worship of prayer, song and testimony (and forgiveness) we dined together over an awesome array of hot dishes, salads and desserts. We were so wrapped in the goodness of the worship and fellowship following, totally forgot to take pictures. The Teen and Adult Challenge choir of 30 voices strong and 60 plus in worship attendance grew in relationship as the Body of Christ. Stories of hope were told, stories of new life, love. We as a community spoke forgiveness and grace from a story that was told. We lived, “This is my story, this is my song, praising my savior all the daylong. Jesus drew us into relationship. It was a precious day of worship. ….. bummer on the missed Viking’s field goal later in the day. Our God Reigns!! Putting Christmas decorations away. More the merrier when it come to helping put away. Let's serve together. See you Saturday morn 9am. 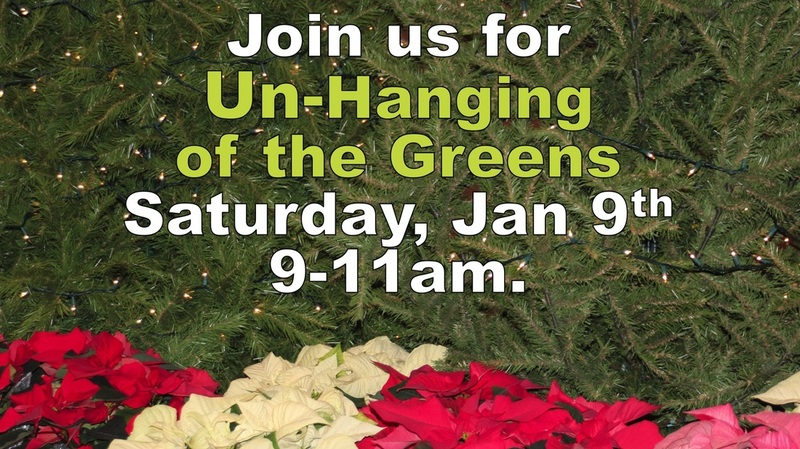 "Un" Hanging of Greens 2016- January 9, 2016. Lots of helpful hands made for good fellowship as we served together putting Christmas decorations back into boxes and stored away in less than an hour and half. Thank you: Kathy, Ron, Joann, Joe, Linda, Deb, Al, Maura, Craig, Judy, Ken, Ken, Caroline, Barb & Polly. A beautiful Advent and Christmas season (Luke 1 & 2) of growing in GRACE with Mary as our example of Grace, God's "free gift". Grace: in waiting, experiencing God's presence, action and fulfillment. Mt Bethel members participated in the Annual Epiphany Service at Old Salem Shrine held on January 3rd, 2016 at 4:30 P.M. This service was a special treat to conclude the family’s holiday season, 40+ dressed for the 20 degree weather. Worshipers enjoyed the customs of the 1800’s by singing traditional Christmas carols by lanterns and candle light with the antique pump organ and wood stove as our ancestors might have done. Old Salem, located at 1505 Upper 55th St. in Inver Grove Heights, is the first Evangelical church in the State of Minnesota and the birthplace of the Evangelical United Brethren denomination prior to its merger with the Methodist Church. Former director of Neighbors Inc , Harv Bartz delivered the meditation; "Hope Always". Happy New Year from Mt Bethel Church. Click for our 3 rules for ministry engagement.